The title stared back at me from the screen. It seemed prophetic. Mute fingers poised, I wondered what on earth had possessed me. How could I possibly write anything that would meet the expectations raised by the previous workshops? I didn’t even have a proper story! Nothing that would hold up as a five-act ritual drama, the format Steve had pioneered as the template for the annual workshops. In previous years, Steve had taken us from a lost mountain monastery to ancient Egypt via an unexplored planet. Stuart had followed with the woven tales of the Foliate Man. All of them wonderful stories. Me? I had a handful of whispering stones, a few fragmentary glimpses into a debatable past and a speculative theory or two. For a moment, only three of the letters of the title stood out… r-u-n. The habit of fear is a hard one to break and, every so often, it creeps back in when you least expect it. It is an integral part of our lives and, as our Shaman so graphically demonstrated during his presentation, to be human may be defined as living in fear. Fear is not necessarily a bad thing…it stops us from getting blasé and allows time to consider reality before we act. It is what we then do with the fear that matters… and that, I knew, was going to be one of the themes of the weekend. There would be several… and the writing of the workshop would, in many ways, mirror the story it would tell. Somehow, it felt right that I should be faced with the resurrection of my own ancient fears right at the start. Such fears highlight lingering insecurities acquired in youth, illusions we impose upon ourselves in reaction to situations and events and which insidiously become an habitual mode of being, rather than a reality based in truth. The moment that we voluntarily step beyond them, we may see them for the chimera that they are. So, having indulged myself briefly with the die-hard habit of panic, I looked again, choosing a shift in perception. We do not work alone… and this would not be the first workshop I had been involved in writing, whatever old fears might try to make me believe. Our ideas and inspiration are drawn from the teachings of the Silent Eye, from our discussions and from the journey we take together. 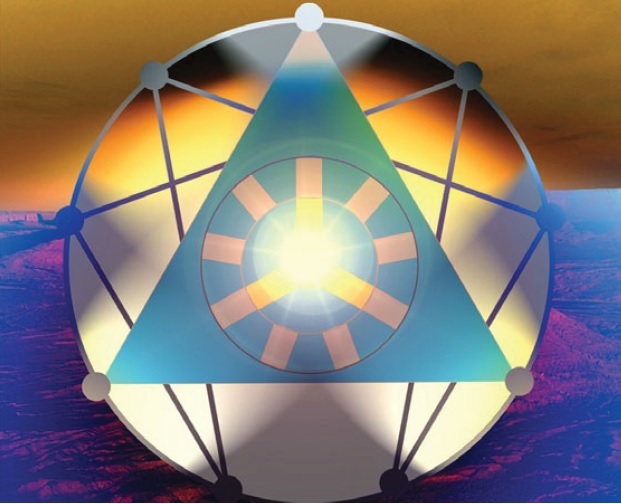 We work with the symbol of the equilateral triangle at the heart of the enneagram… and each point of that triangle, regardless of which way you place it, has a stable base to rest upon. It does not matter which of the three points you look at, all are supported by and equidistant from each other and from the invisible centre. Whoever finally puts pen to paper, the creative journey is a shared one and, while we serve that invisible centre, we draw inspiration from the source of the Light that we serve.